Launched on April 3, the Powerbeats Pro are $249 wireless earphones under the Beats brand that offer practically everything that Apple's AirPods provide, but in a more fitness-friendly packaging. In its latest YouTube video for the Beats by Dre channel, Apple takes time to highlight just how suited to activity the audio accessories really are, due to how they hook around the ear. 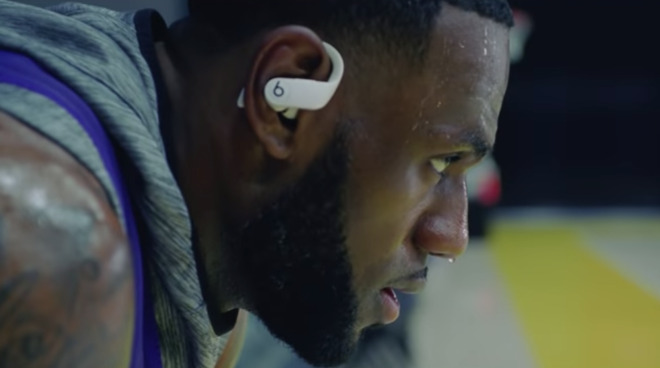 Accompanied by Beck's "Saw Lightning," the minute-long video features a number of famous sports stars and athletes wearing Powerbeats Pro while working out. The video starts off with gymnastics, before moving through other sports including skateboarding, soccer, rock climbing, sprinting, and boxing, with the earphones staying in the center of the frame throughout most of the high-speed action. Using the same H1 chip used in the AirPods, the Powerbeats Pro are claimed to offer superior cross-body Bluetooth connectivity and support for "Hey Siri" vocal prompts. Wearers can enjoy up to nine hours of usage per earbud, with more than 24 hours of combined playback using the built-in battery of the magnetic closure case, and a "Fast Fuel" facility can allow up to an hour and a half of charge to be accumulated in the earbuds after just five minutes of charging. . Beats will be shipping Powerbeats Pro in the United States and 20 other countries in May for $249.95 in a choice of Black, Ivory, Moss, and Navy color options. Some nice image stabilization, artifact centering and focusing in the video. Some of the videos may have been radially blurred on purpose? Didn’t see anybody wear glasses and the PowerBeats Pros though. I may get a pair for the spouse though. Didn’t even anybody wear glasses and the PowerBeats Pros though. I may get a pair for the spouse though. Wearing glasses with Powerbeats3 is a non-issue. I assume it will be the same with these. Didn’t [see] anybody wear glasses and the PowerBeats Pros though. I may get a pair for the spouse though. It’s a non-issue for you or perhaps someone you know. It’s an issue for me. All the headphones have their pluses and minuses in terms of comfort for me. The ear hooks going around my ears can become intolerable versus in-ear or ear bud models. On-ear models heat my ears up too much. Around-the-ear can get pretty sweaty too. The blurring is a by-product of footage shot at a normal speed (likely 29.97 or 30 FPS) instead of high-speed footage (such as 60 or 120 FPS). They should’ve shot it at a higher speed to rid the images of excess blurring. Also, it’s not image stabilization, it’s tracking. If they had tracked the Beats product AND had sufficiently high-speed imagery, there would be almost no blurring. I almost asked if they used iPhones to film all the video, but probably not. If you’re looking for good workout buds, you should look at the Jabra Elite 65t’s, I think you’d be impressed. Plus, they stay in the ears perfectly with no hook, so wearing them with glasses is a non-issue! What they don’t tell you is that LeBron James hurt his knee in the commercial and then stayed in bed for 3 months. My Powerbeats3 are the best earpieces for sound quality that I have ever owned! And I still have my custom Ultimate Ears UE10s ($950) made by Jerry Harvey in 2005 before they were taken over by Logitech. I also own top-of-the-line Jerry Harvey Audio Layla ($2,800). The Layla are incredible but the Powerbeats3 sound better. Sooo... can’t wait to get my hands on Powerbeats Pro! Will probably have some custom in-ear sleeves made to help with sound isolation. Thats my only gripe. The different tips supplied just don’t work for me unless I keep the earpieces pushed into my ears. I assumed the the person responding wears glasses and is saying they have no problems with the current Powerbeats3 with glasses, so these won't be an issue. I don't think it was meant as a who cares it isn't an issue? I really, really, really, hope these are good. The Powerbeats 3 are absolute trash, literally the worst Apple product I have ever owned. They have a well deserved 2 star rating on Apple's store and for a long while it was 1 star. They can not handle virtually any sweat in most cases and frequently the Bluetooth fails, or the volume controls go out (permanently). Had and returned over 4 pair, went back to Powerbeats 2 (pre Apple model) and they work fine, for the most part. I'm one of the small percentage of people that have ears that can't hold the AirPods so hooks are a necessity for me. Hopefully they addressed the waterproofing issues with these. No worries, if bonobob finds the PowerBeats Pro a non-issue while wearing glasses, more power to them. I can make use of these PowerBeats Pros too if I don’t wear my glasses. Something the spouse would like moreso. Can be placed in purse or bag, charged through existing Lightning cables. Easy to transfer among Apple devices. They are a good deal for the convenience. Doesn’t look pocketable though. We’re not picky about sound. I am picky about comfort. Waiting on a cordless version of Apple’s old in-ear headphones. Those had really soft and pliant silicone tips. Love those. If Apple shipped a cordless version of that, with both foam and silicone tips, instant buy.